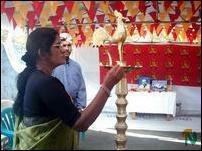 Ms.Thurairajah, mother-in-law of Colonel Kittu, lit the flame of sacrifice at the event held in Trincomalee town LTTE political office Friday. Kumburupiddy area LTTE military commander Mr.Eehan hoisted the Thamileelam national flag and thereafter several leading citizens and parents of LTTE martyrs paid homage to Colonel Kittu and other LTTE cadres by offering flowers. Trincomalee district LTTE martyrs unit head Mr.Thennavan presided. Mr.Sahul Hameed and Mr. Kanagasabai Thevakadachcham spoke. In the Muttur east in the villages of Santhosapuram, Sampoor, Kattaiparichchan, Pattalipuram, Koonitheivu, Pallikudiruppu, Verugal, Ilakanthai and Veeramanagar the death anniversary of Colonel Kittu and nine other LTTE cadres was observed.